Shark Stanley has been on a whirlwind trip around the world to look for people who will support protecting shark and manta ray species at the upcoming Convention on the International Trade in Endangered Species in Bangkok, Thailand. 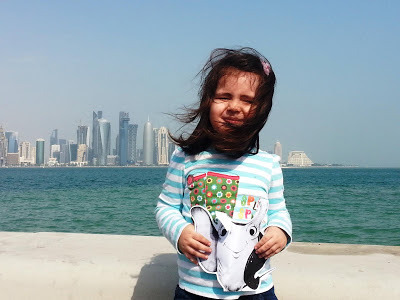 This morning Shark Stanley and his friend Manta Reina visited a young girl named Maryam in Doha, Qatar, his 50th country since the start of the campaign. In addition to visiting 50 countries, Shark Stanley's materials are now translated into 12 languages: English, Español, ภาษาไทย (Thai) , العَرَبِيَّةُ (Arabic), Nederlands (Dutch), Indonesian, Tagalog, 日本語 (Japanese), Français, Deutsch, 繁體字 (Chinese), and Português. Shark Stanley still has a ways to go before he reaches all 177 countries, especially those in the Caribbean, Africa, and Eastern Europe. If you have any connections in other parts of the world, or if you can translate our materials into your native language, please contact us at info@sharkdefenders.com. We are also still adding partners everyday and hope that your organization will join us.